“What do you mean you never learned about Susan B. Anthony in school?” No, that wasn’t a parent’s admonishment to their child, that was my teenage daughter’s reaction to me (her dad). It’s true, not growing up in Rochester, I knew very little about Susan B. Anthony – other than the stern looking woman on a failed U.S. Dollar coin. Given my daughter (who scolded me) had never been to the Susan B. Anthony Museum & House either, we recently trekked downtown for a tour. 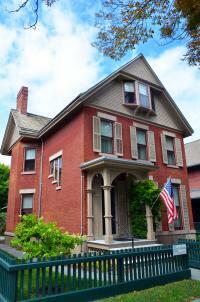 Located just off Main Street, 17 Madison Street was Susan B. Anthony’s home from 1866 until her passing in 1906. 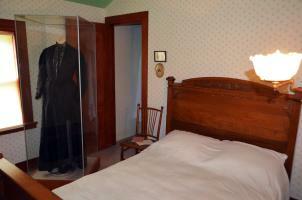 The house contained many original fixtures and furnishings from Anthony’s life. Holding onto the banister that Susan B. Anthony gripped gave me goosebumps, and standing in the parlor where Anthony was arrested in 1872 was breath-taking. However, learning the story of Susan B. Anthony’s lifelong struggle to gain voting rights for women from Linda Lopata, our passionate and energetic docent, was the true thrill. 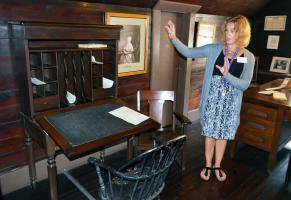 Linda brought the house and Suffragist to life pointing out the desk where Anthony wrote, her furniture, papers & photographs, and silk brocade dress. These preserved items whetted our appetite to learn more about Anthony’s life on the front lines of history, and Linda wove a complicated story full of nuance and intrigue about Susan B. Anthony’s work for women’s voting rights, abolition of slavery, education reform, and more. 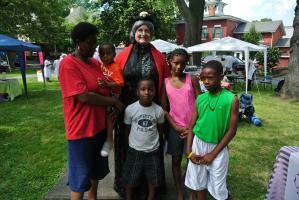 After our tour of the house and learning of her complex relationship with Frederick Douglass and the anti-slavery movement, we headed down the street to the Susan B. Anthony Square and Historic Park. 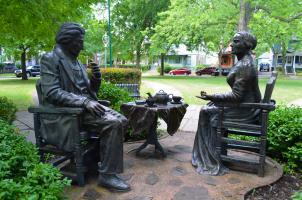 Pepsy M. Kettavong’s sculpture “Let’s Have Tea” depicts Douglass and Anthony engaged in an intense discussion over the issues of the day. Discussions that certainly have as much relevance in the 21st Century as they did in the 19th. At 86 years old, Susan B. Anthony gave her final speech in Washington DC where she looked upon the gathered crowd and said, “failure is impossible” as the tide was turning towards granting women the right to vote. 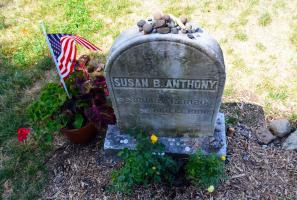 She may have passed before the 19th Amendment gave women that right, but Susan B. Anthony’s legacy lives today. 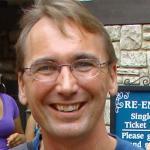 Just ask City of Rochester Mayor Lovely Warren who placed a “thank you” sign by Anthony’s tombstone when the first woman was selected as the presidential candidate for a major political party in 2016, or the hundreds of citizens who placed their “I Voted Today” stickers upon the grave after exercising their right. My daughter and I left the Susan B. Anthony Museum & House that day inspired by the woman as well as by the people who continue to work to keep her vision alive. As my daughter heads off to college, she will take Anthony’s message with her.